Incredibly fast growing in the right position, perfect for a quick screen! Tall, striking foliage plant. It is evergreen, with multiple stems that form a dense clump. Very hardy with large dramatic leaves for a true tropical effect. 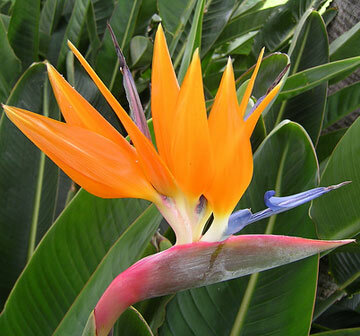 Huge flowers resemble birds heads like the smaller Bird of Paradise and can be used as a cut flower. Flowers appear within a year in the right conditions and continue to flower for most of the year. Their strong root systems are best kept away from buildings. Excellent indoor and potted plant, even in exposed positions, but provide some shelter from strong winds. Full sun to part shade. Prefers well rained soils. Easy care: mulch garden specimens, water only when very dry, and provide some slow release fertilizer in spring if you want the fastest and greenest growth. Handles light frost.